Our trained aestheticians specialize in corrective and enhancing skincare with a focus on acne and rosacea, as well as aging skin. Our staff is skilled in enhancing treatments including the judicious use of Botox®, Epionce, DermWORX, dermal fillers and PRP. We have experienced hair removal technicians and also offer packages that include facials and massage. We primarily utilize SkinCeuticals products in our facial treatments. Your face is under attack daily. Get rid of the dead skin and rejuvenate your skin with one of our facial services. Dermaplane is the process of exfoliation. With this service, we remove dead skin and hair leaving your skin vibrant and rejuvenated. Let your skin feel brand new with one of our various peel services. For faces of all levels of sensitivity, we have a solution to help your skin look its best. Do your face a favor and get microdermabrasion, a treatment that can reduce the effects of aging. Through a process of magic wands, hydration and nutrients, your skin will look years younger and be forever thankful. 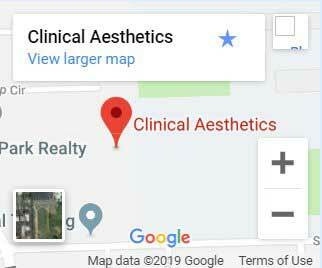 Clincal Aesthetics now offers a range of medical services to help you look like who you are. These invasive procedures include Botox ®, Juvederm and Perlane fillers in addition to our Platelet Rich Plasma Therapy, Galvanic Spa and Latisse products. Our staff can do everything else both women and men need, too. From acupuncture to everything in-between, our Spa Services satisfy your every last need. Cleanse+ Peel: Uncover a new layer of skin with gentle exfoliation, relaxing and resurfacing. Extract +Hydrate, Remove debris from pores with painless suction. Nourish with intense moisturizers that quench the skin, Fuse + Protect Saturate the skin’s surface with antioxidants and peptides to maximize your glow. April 25th HydraFacial Signature Event, RSVP Today! Cleansing, Exfoliation (with Glycolic or Lactic Acid), Calming balm. To obtain best outcome we suggest a series of peels every other week for 6 times, then monthly after that. BOTOX and XEOMIN are similar products used to improve the appearance of moderate to severe frown lines for a temporary period of time. They work by blocking nerve impulses to the injected muscle thereby relaxing them. Belotero®, is a dermal filler used to replace lost volume and restore youthful contours to the skin. Such fillers are used to smooth away moderate to severe facial wrinkles and folds, Results are temporary basis as the fillers are absorbed by the body over time. Results may last from months to years, depending on the type and amount of product used along with the individual’s response. These products are now also available with lidocaine, an anesthetic that eases the discomfort associated with the injections. LATISSE® is the first and only prescription treatment approved by the FDA for inadequate eyelashes, growing them longer, fuller and darker. It’s a once-a-day treatment that works gradually and effectively. You apply the solution topically to the base of your upper eyelashes, as instructed by your doctor. Then, results start to show in as little as 8 weeks, with full results in 16 weeks.